Volcano volcanic dust is easy to settle in water. Therefore, water wells affected by volcanic ash will still look clear. However, to prevent risks from substances harmful micro, wells should be drained before use. This is expressed by the Head of Natural Disaster Study Center Gadjah Mada University (UGM), Yogyakarta, Junun Sartohadi, when contacted from Jakarta on Monday (8/11/2010). It preventive action to eliminate the drainage wells contain heavy metals that attach to the volcanic dust and settle to the bottom of the well. Heavy metals are micro elements that exist in all types of rock. Kind of heavy metals in volcanic dust, among others, cadmium (Cd) and copper (Cu). Although very few in number, the body can not completely exposed to heavy metals. "With the drained, well water it would not make crystal clear, but free from heavy metals that are hazardous to health," he said. According Junun, depletion is the only way to remove heavy metals from the well. Use a neutralizing agent and penggumpal or coagulant will not remove heavy metals. Heavy metals are elements that are not easily neutralized, whereas coagulant only serves to purify water. In fact, volcanic ash affected water remains clear. Similar drainage needs to be done at reservoir-reservoir springs so that the water used healthy society again. Junun asked the government to immediately think of steps cleaning dust from the residential community. After cleaning the home and community environment of dust, dust it should be moved to another place, do not be left sitting in the settlement residents. Volcanic ash pile would remain because it will affect the health of citizens easier to fly in the wind. Dust removal can be directed to areas of barren and areas with thin soil layer. "The particles of volcanic dust is very easily decomposed, so it is nice to use as a soil material. Desolate place would be fertile, "he said. Expert clay mineralogy of the Department of Soil Science and Land Resources, Bogor Agricultural University, Iskandar, acknowledged, rich volcanic ash soil fertilising nutrients. However, penyuburannya process will take about 10 years. Efforts acceleration can be done by adding compost, urea, and extracts of humic substances extracted materials-organic compounds in humus. In laboratory tests, the addition of the compound will accelerate the weathering until quite five years. Iskandar added that the cold dust can be directly used as planting media, but not sesubur 10 years later. Its the same with the sand generally. For areas that have thin ash rain, dust there must be utilized. The exterior of the new lot of dust which still contains nutrients. If left unchecked, will be dissolved nutrients carried by rain. "Thereafter, the usefulness of volcanic sand must wait until the release of nutrients in the sand when sand particles decayed," he said. 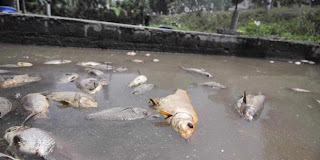 Meanwhile, the death of fish in the pond residents due to rain or volcanic ash is considered an expert of pests and diseases of fish from the Department of Fisheries UGM, Kamiso Handoyo Nitimulyo, caused by changes in density and temperature of the pool water. Pool water is too murky to make the gills can not work well and damaged and unable to take oxygen. Water-filled dust will also reduce the oxygen content in pond water. In areas near the peak of bursts of dust, the dust will be very hot. If you enter the water, pool water temperature will change abruptly, so the fish in it died. "Catfish and carp are the species of fish are more powerful live in turbid environments," he said. 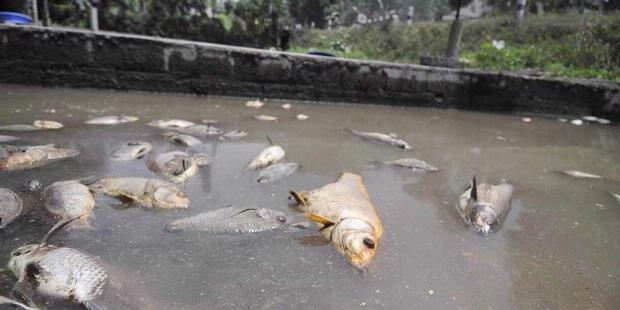 To avoid the death of fish in large numbers, according to Kamiso, areas exposed to dust thin should immediately replace the water ponds.